The Daily Trail: Has the Republican Party had enough of Donald Trump? Hi all. I'm Amber Phillips with The Fix, and I'll be guest hosting The Daily Trail this week and next. Trump had a lot to say today. A lot. More on that below...but first: the context. With GOP Sen. Susan Collins of Maine announcing she's not voting for Donald Trump, and Trump appearing to encourage gun owners to take action if Hillary Clinton appoints anti-gun judges, the time has come to ask: Have we reached a turning point in Republicans' relationship with their nominee? Is this a moment we'll look back on as the beginning of the end for Trump's support in the party? My unsatisfying answer to that: It depends how you ask the question. Let's break it down into three categories to get a better sense of whether we are indeed in a turning point with Trump and the Republican Party. 1. How many Republicans are un-endorsing Trump? Depending on how you count their sometimes-vague answers, somewhere between 10 percent and 20 percent of Senate Republicans have said they won't support Donald Trump for president. Stat of the day, via @JakeSherman: "11 percent -- six of 54 -- of Senate Republicans have said they will not support their party's nominee." By my count: 5 GOP Senators have stated they won't vote Trump; 6 others don't support him (without going that far). That's 20% of caucus. A handful of House GOP lawmakers have said the same, and at least one said he's voting for Hillary Clinton. (Though Rep. Richard Hanna (N.Y.) is retiring.) Top Republican donors and figures past and present are endorsing Clinton on a near-daily basis now, and they add up to more than two dozen, by my colleague Aaron Blake's count. Two dozen-plus might sound like a lot, but that's nowhere near a majority of the Republican Party. In fact, in our latest Washington Post ABC News poll, 83 percent of Republican registered voters said they'll be voting for Trump over Clinton. But! Even this percentage of defections is historically unusual, said Robert David Johnson, a history professor at Brooklyn College. Cross-party endorsements are rare in modern-day politics, especially when they're coming from across party lines that are so ideologically divided. "In a period where the parties are so ideologically grouped, having this many non-endorsements from legislators is almost inconceivable," he said. "And so it does suggest there is something really, really unusual going on here." 2. Why are they un-endorsing Trump? Then there's the motivation factor. When trying to assess whether the Republican Party is turning on its nominee, why people decide to speak out against him is a critical factor. It's also one that's tough to pin down without getting inside their heads. Are the Republican figures past and present coming out against Trump now doing so because he's suddenly proven himself an untenable candidate to them? Or are they simply voicing opposition they've held since the primaries? Or is there another, more personal motivation? To try to answer that last question, it's not difficult to see how un-endorsing Trump could actually benefit some Republican politicians in moderate states. A politician from a moderate state where Trump isn't that popular, like Collins, who's not up for reelection until 2020 (or, if she wants to run for governor of Maine, 2018), might be betting she has a much better chance of being reelected if Trump loses in November. Assuming future Trump is as unpopular as present Trump, we've already seen a glimpse of how Trump could drag down vulnerable Senate candidates in his party. Two recent polls showed Trump trailing by double digits in the swing states of Pennsylvania and New Hampshire, and the GOP Senate candidates there struggling in those polls, too. My colleague James Hohmann noticed a trend about these un-endorsements that he wrote in his political newsletter, The Daily 202: "Every Republican who has bucked Trump can be pretty easily categorized. A clear pattern emerges: The less directly and immediately accountable to Republican base voters an elected official is, the more likely he or she is to break with Trump." It's also notable that some Republicans seem to be questioning Trump as the party is already locked into its nominee. Short of death, coma or Trump just deciding not to run, there's nothing in the rule books to keep him from staying Republican nominee in November. So what good can coming out against him in August do, other than hurt his chances and perhaps boost others? 3. Is this hurting Trump in the court of public opinion? Finally, we look at the publicity factor of this steady drip drip of Trump un-endorsements. And that's probably the most difficult to measure. Nearly every day, it feels like there's someone high profile expressing his or her displeasure with Trump. On Friday it was the former CIA director. Over the weekend it was a retiring Virginia congressman, who said he'd vote Libertarian. On Monday it was 50 former GOP national security officials. On Tuesday it was Collins (and a handful of former Bush administration officials). To anyone paying even the slightest attention to political news, it certainly feels like the party is abandoning Trump. That's not a good storyline for Trump to start the general election with. When he endorsed Speaker Paul Ryan (R-Wis.), Trump signaled that party unity is indeed important to him (although he's also said he thinks he could win without it), These defections risk driving the narrative about Trump that he's unfit to be president. But how much of this is internal party politics that is merely background noise to the rest of voting America? Does the average voter know or even care who Michael Chertoff or William Reilly or even Collins -- the most prominent un-Trump supporter so far -- is? And once they find out, will it affect how they vote? That's the million dollar question. Besides, if you're to believe Trump himself, all press is good press. By that definition Trump has the full attention of the Republican Party and the American public. And by that logic he is winning, not losing. By most standard measures, he is not. I personally think it's less clear whether the Republican Party has reached a turning point with its nominee, but the fact we're talking about this at all is a significant political moment. So much for Tuesday's pivot. 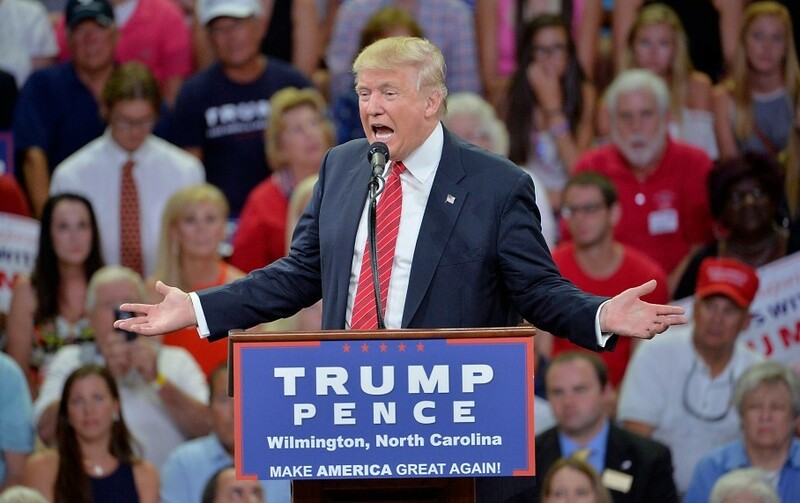 Trump said Tuesday at a rally in Wilmington, N.C., that 'Second Amendment' people may be the only check on Hillary Clinton and her judicial appointments. If you can't watch the video right now: here's what Trump has to say in the clip. The Secret Service said they're "aware" of Trump's comments. Team Clinton's response to his comment was swift and clear: "What Trump is saying is dangerous." Trump's response: It's the media's fault. Earlier, Trump ally Newt Gingrich was asked by the New York Times whether he thought Trump has the "mental fitness" to be president. His answer? A not-necessarily reassuring: "Sure." (Despite several queries, he never quite graduated to a firmer response.) "Asking if your candidate is mentally suited to the presidency is a pretty low bar," The Fix's Aaron Blake writes. "You are supporting the guy! We would hope you have enough confidence in his thought process that you can be more affirmative and say something nice." Nonpartisan election analyst and Washington Post columnist Stuart Rothenberg says Trump is "going to need a miracle to win." Because the polls, people. Clinton is polling some 9, ten points ahead of Trump in national polls, her favorability rating is up while Trump's is down. A Washington Post-ABC News poll shows Clinton getting 11 percent of Republicans, a larger percentage than any Democrat has received over the past four years, he writes. Long story short, Democrats are holding it together while Republicans aren't. 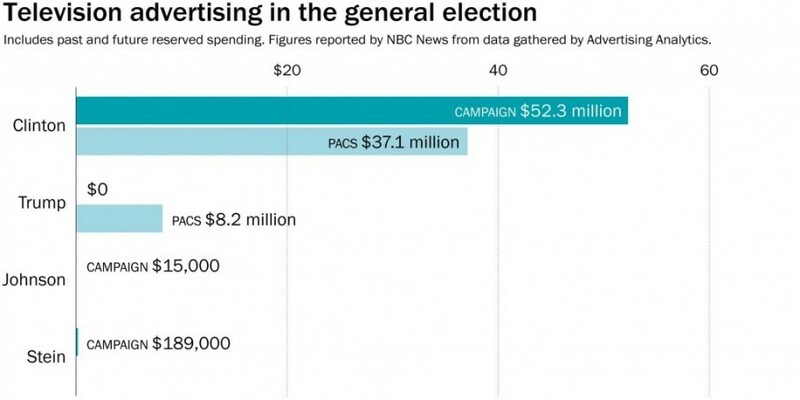 Trump has spent exactly nothing -- $0 -- on TV ads so far, finds The Fix's Philip Bump. Meanwhile Clinton has spent $13.6 million alone during the Olympics coverage alone. Which raises the question: With about 90 days left until the election, when is Trump going to start campaigning? Following her remarks, Clinton ignored a shouted question about Omar Mateen's father attending her rally in Kissimmee yesterday. Sen. Collins tells @NewsHour she's received emails & texts from GOP & Dem colleagues "applauding my op-ed and supporting what I've done"
Mike Pence (who has not seen Trump's remarks): "We’re swimming up stream here against overwhelmingly biased national media." YOUR DAILY TRAIL PIT STOP: What he said.